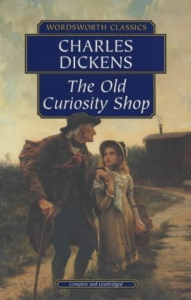 The Old Curiosity Shop was one of two novels (the other being Barnaby Rudge) which Dickens published along with short stories in his weekly serial Master Humphrey's Clock, which lasted from 1840 to 1841. It was so popular that New York readers stormed the wharf when the ship bearing the final instalment arrived in 1841. The Old Curiosity Shop was printed as a separate book in 1841. Queen Victoria read the novel in 1841, finding it "very interesting and cleverly written."